The Donlin Gold Mine Needs To Move A Mountain. How Close Are They To Making That Happen? One of the biggest gold mines in the world could be built along the Kuskokwim River, north of Bethel. The Donlin mine has escaped the intense level of public scrutiny aimed at the proposed Pebble Mine in Bristol Bay so far, but it’s much further along in the permitting process. Listen here for the tour of the Donlin mine site. Supporters say that the mine would bring much needed jobs to the region, while opponents worry it will threaten their subsistence way of life. To visit the proposed Donlin mine site, you have take a small plane. I toured the site in July with Kurt Parkan, the spokesman for Donlin Gold, the company developing the mine. Donlin organized and paid for the flight. There isn’t much at the site right now: just a long airstrip, with clusters of sturdy buildings in the middle of green mountains close to the Middle Kuskokwim River. Donlin wrapped up most of its exploration before 2012, but workers continued environmental testing and monitoring water quality as the company worked with the Army Corps of Engineers to wrap up its lengthy environmental review. But now the camp is closed as Donlin awaits the rest of its permits. We get in a helicopter to see the rest of the extensive mine site. Right now it’s mostly dense black spruce forest, but Donlin’s proposal would turn this area into a large open-pit mine. That means Donlin will dig two big holes that will eventually merge into a large pit. At its peak, the pit will be a more than a mile wide and two miles long. And once Donlin stops mining, that pit will eventually hold the water used in its operations. The water will already be treated by large facilities for the cyanide used in its operations and the mercury that is released from the rocks surrounding the site, Donlin said. After we get off the helicopter, Parkan says that the mine would be in the top 10 percent in the world for a gold mine because of its deposit size and production. “Basically we’re moving one mountain to another and taking the gold out during the process,” Parkan said. The site sits in one of the most remote regions in Alaska, so Donlin will have to build roads, a long gas pipeline, a power plant, a port, and an airstrip for its operation. All that infrastructure and mining will disrupt 2,800 acres of wetlands. However, Donlin will mitigate about 700 acres, both on site and in a different location, to make up for the impacts. To build the mine, Donlin needs about 100 permits from federal and state agencies. Donlin’s supporters argue that the mine would bring jobs to a region with high unemployment and poverty. Bethel resident Moses Tulim says that the Donlin mine will open up economic opportunity. “Well, you go into any village and you name basically the same number of employers or identify the same number of employees,” Tulim said. Tulim was born in Chevak, but has lived in Bethel for the past decade. He’s seen people leave the villages to find work and not return. He says that jobs could help keep young people in the villages. “As a result, many more young people will be looking at relatives working in the mining industry, and they’ll have role models that they’ll be looking up to who have good paying jobs and able to afford more things: snow machines, boats; and help continue on supporting their subsistence way of life,” Tulim said. But many in the Yukon-Kuskokwim Delta have big concerns about the mine. They worry that the extra barge traffic will damage spawning grounds for smelt and chum, and some fear that a mine accident would contaminate the Kuskokwim River. The first tribe in the Y-K Delta marched against the proposed mine this past summer in Bethel. A local working group formed to oppose it as well, but most of the protests are local. Unlike the Pebble mine in Bristol Bay, Donlin has a lot of political support in Alaska; the three gubernatorial candidates have endorsed it. And unlike the Pebble Mine, which could operate on state land, Donlin must lease the surface and subsurface rights from two Native Corporations: Calista Regional Native Corporation and the Kuskokwim Corporation. Crooked Creek is the village closest to the mine. Its traditional council endorsed the mine in a resolution 10 years ago, but some people in the community have concerns. Mishka Andreanoff is a Yup’ik Elder who lives in Crooked Creek. He doesn’t like the mine. Andreanoff says that he worked for Donlin during its early exploration days. He used to hunt and trap in the mine site area before the company closed it down. He’s afraid that the mine could bring in more people than the village can handle. “We're having problems with alcohol and all of that, and there'll be more of that when the mine opens up,” Andreanoff said. Donlin’s Parkan says that the company understands those concerns, and he says that Donlin will build the mine safely. Parkan can’t say when the mine is likely to break ground, but says that it’s years away. The mine is currently moving through the permitting phase, getting its final Environmental Impact Statement and major permits this year. “We just received our federal permits, so that’s probably the biggest milestone to date; we’re continuing to work towards getting our major state permits,” Parkan said. 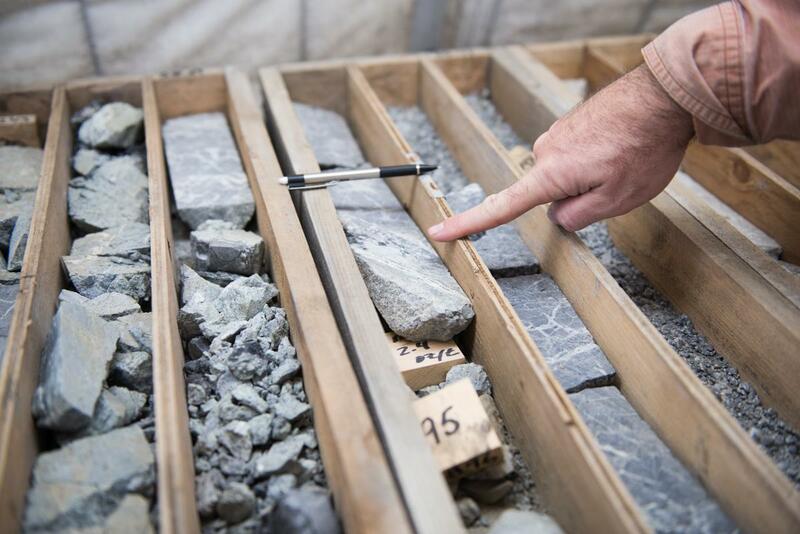 Donlin expects to get most of those this year, but the company will need to determine if gold prices are high enough to begin building the mine. An analyst with financial firm S&P Global says that the current gold market is pretty good for development, and will likely stay that way for a while. However, constructing the mine could cost as much as $6.7 billion. Parkan says that the company has already invested $500 million in exploration and the permitting process. He says that means Donlin is serious about developing the mine. The post has been updated with official numbers from Donlin Gold about the cost of constructing the mine. And a previous version of this post mistakenly said that the pit would become the tailings dam.